It is with tremendous sadness and heavy hearts that FOMP will bid farewell to Tim Watkins, a friend, as well as founding, beloved, and instrumental member of our organization and community. 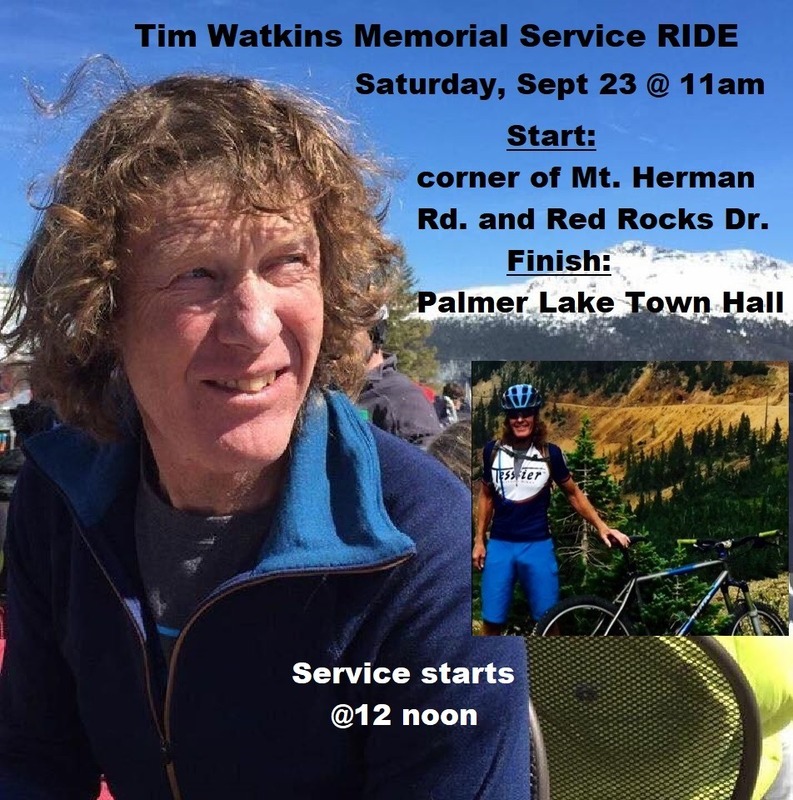 Tim selflessly gave us all countless backbreaking hours building and maintaining area trails and smile after smile. As a result, we all enjoy many miles of the best biking, hiking, and equestrian trails anywhere in the world. We all owe Tim and his family our eternal thanks. Details for Tim’s memorial service are outlined below. In the event that you can not see the image, it’s this Saturday, 9/23/2017 from 12:00-2:00 PM at the Palmer Lake Town Hall. The family has requested that you ‘dress like Tim’ #beliketim. Cyclists will be gathering (all skills and styles welcome) at 11:00 AM at the corner of Mt. Herman Rd. and Red Rocks Ranch Dr. and taking a casually paced ride over to the service. FOMP will hold a trail building/maintenance day in Tim’s honor on October 7, 2017 (a Saturday). We will be renaming the section of trail we work on for Tim. We will announce the necessary details through our mailing list, website, and FaceBook page early next week. Please plan on joining us! Timmay! From all of us, Rest and Ride in Peace. May all of the rides be long, downhill, and buff singletrack! This entry was posted in Board Meeting, FOMP, Limbaugh Canyon, Members, Trails on September 22, 2017 by chris.